I just can't believe that it has finally happened! I am soooo excited! 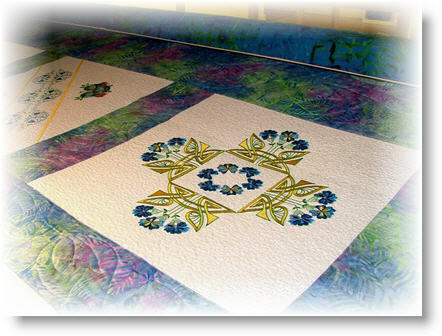 Innova Longarm Quilt machines now have the ability to embroider! 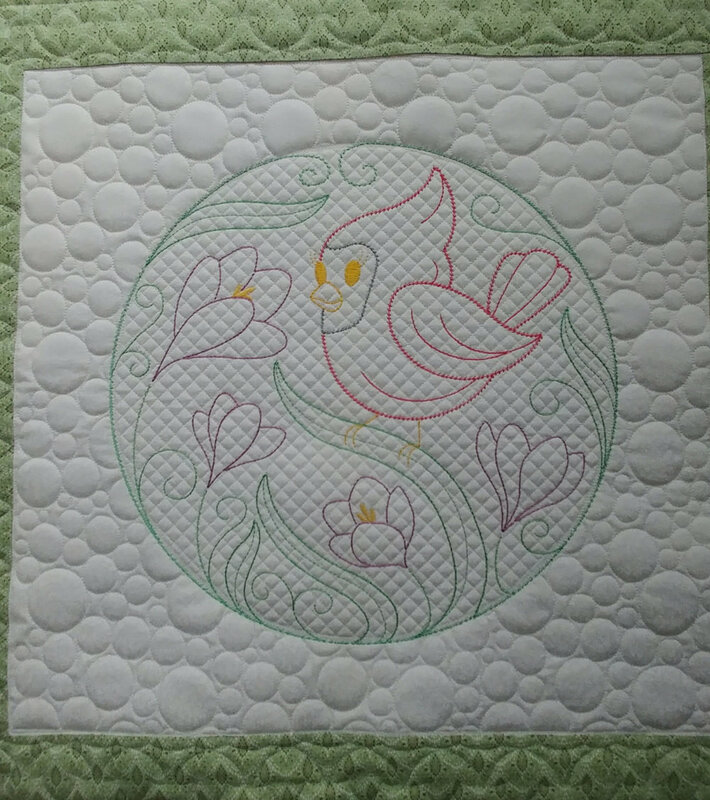 It wasn't that long ago that I wondered about the possibility of combining my two favorite things --- quilting and embroidery--- and now the future has arrived! Just imagine having a hoop that is 20 inches high by......almost 14 feet long! Yes, you read that right. Fourteen FEET. The possibilities are endless. I can use designs that I have already designed (or purchased) in a DST format. 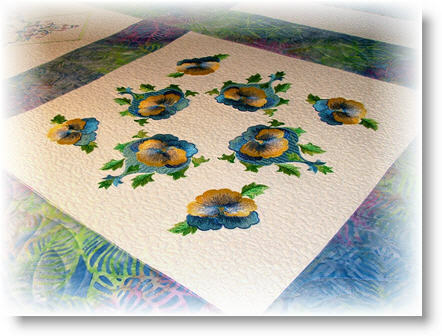 I bring them into the Mach 3 software on my Innova machine and I am ready to stitch! 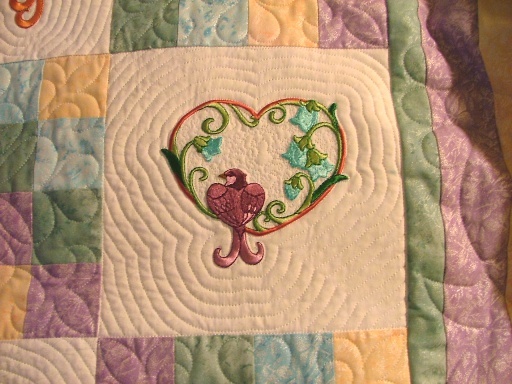 The first day I tried the new Grand Format Embroidery, I was able to quilt a project first, and then add embroidery to it. It reminds me of a vintage approach. The second time I tried it, I made a cross-hatched kind of background with bubbles and then added embroidery to that. 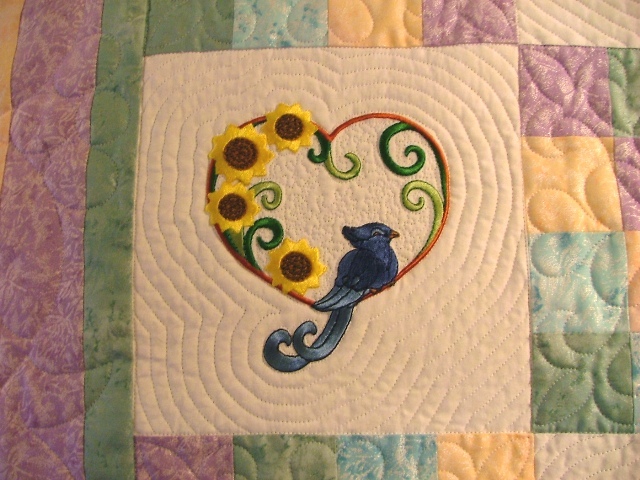 For my third project, I decided to try applique right on the quilt machine! I pre-cut my daisies using a Brother Scan N Cut machine. 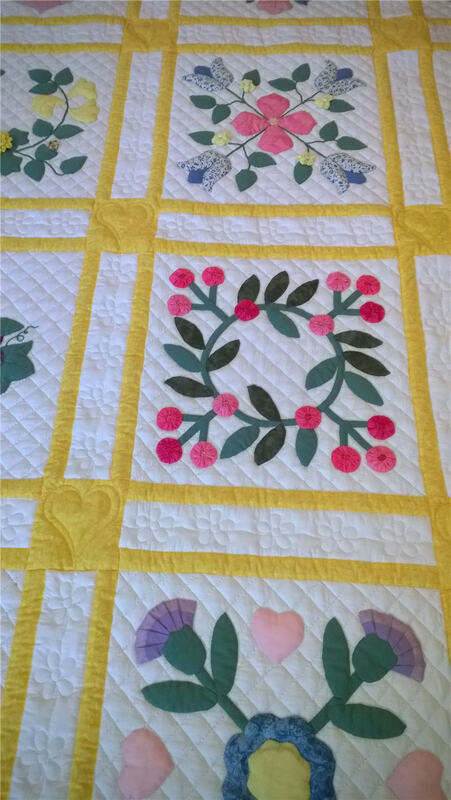 First I quilted the table runner, then I ironed on the applique pieces, and then I embroidered them. 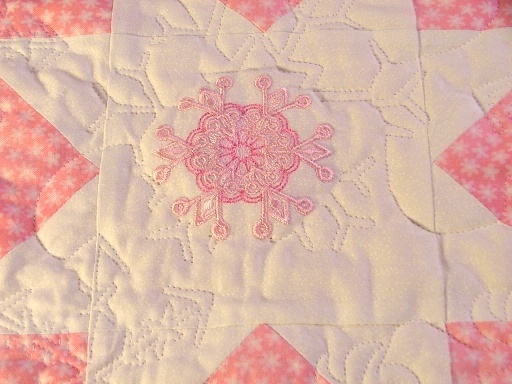 To finish it off, I quilted the border and then added binding. Ta da! 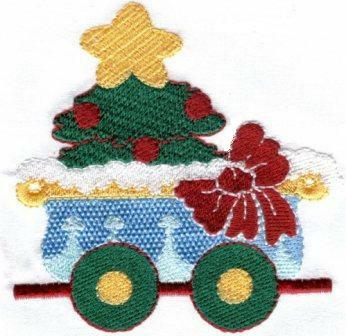 The pattern for this runner is available to owners of Innova Grand Format Embroidery users in our shop. 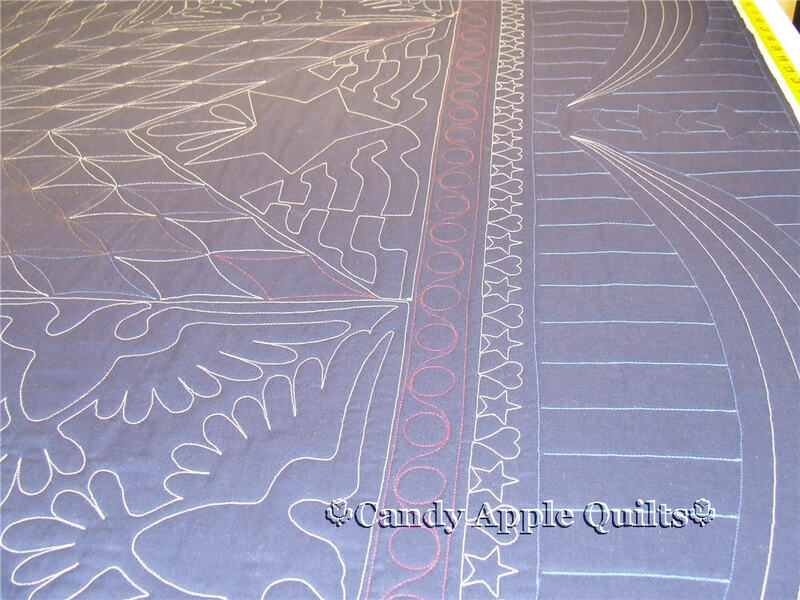 Please contact robin@CandyAppleQuilts.com if you own a Gammill machine with Statler Stitcher and an embroidery machine, and I can make the files available to you for stitching. 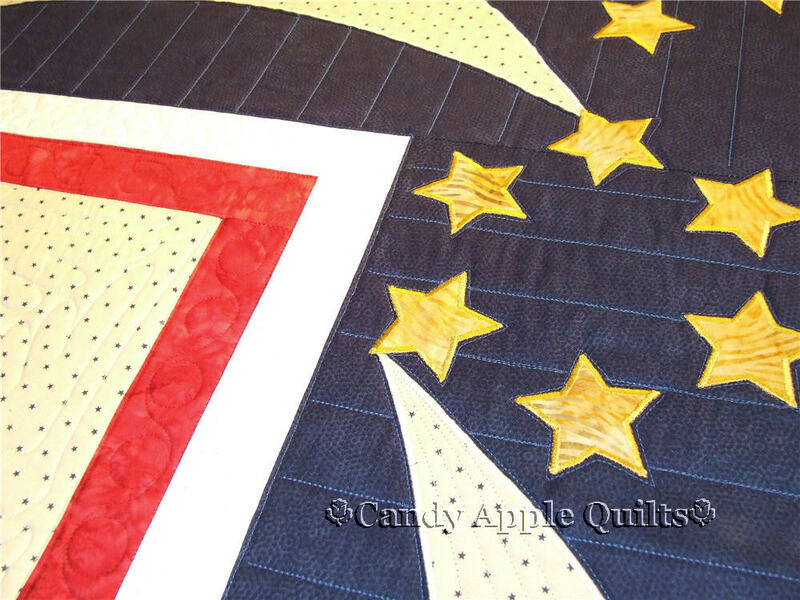 I had the pleasure of quilting one of the Route 66 quilts from Crabapple Quilt Studio recently. What an absolute thrill! The proper name of the pattern is Vintage Tin --- perfect! 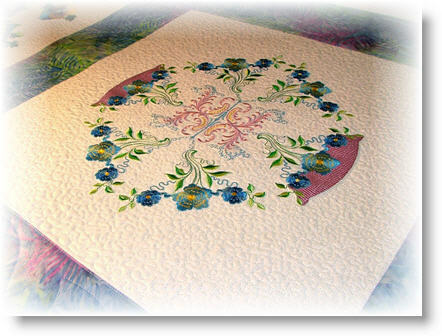 According to their description of the pattern: "Vintage cars, trucks and cycles cruise down Route 66 on this 63 1/2" x 69 1/2" quilt. 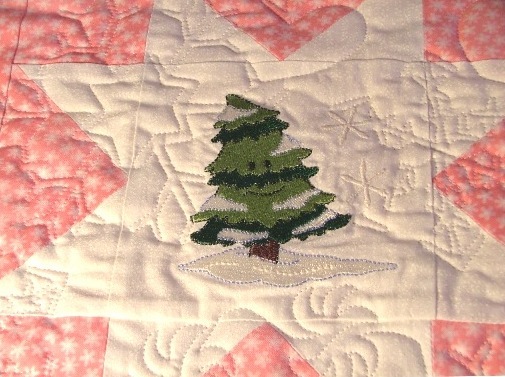 Simple, simple stitching and easy piecing make this quilt a snap. The perfect gift for the men in your life! 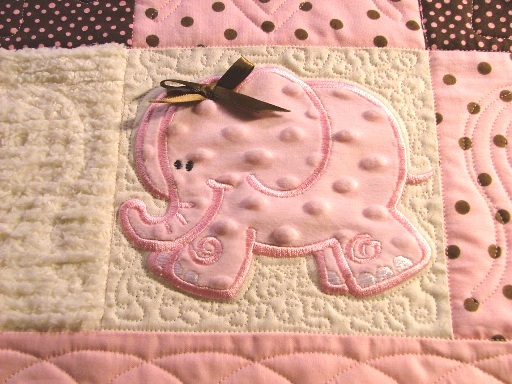 There's even a quilt label included that "reads" like a speeding ticket! A giant step into the past...how much fun is this??" 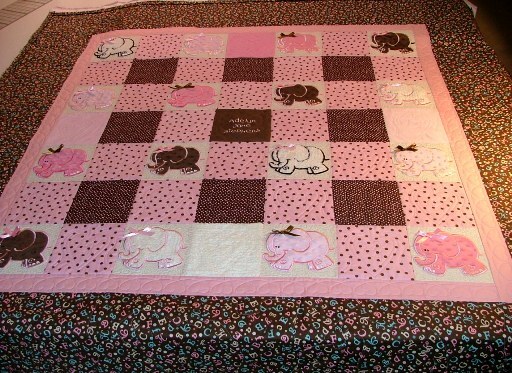 And I have to add how much fun it was to quilt! 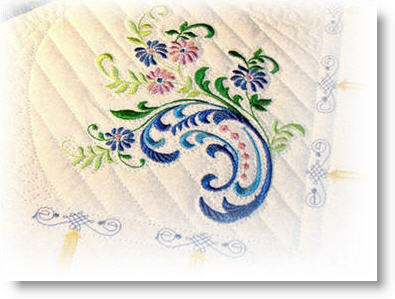 There was lots of hand embroidery, and all of the designs just added to the "flavor" of the quilt. If you have been considering getting this one, I strongly encourage you to do so right away. You will love every minute of working on it! 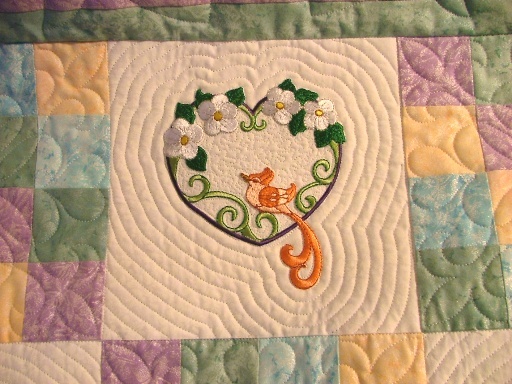 This quilt was partially hand quilted, and then Elaine decided to try stitching the outer border on her sewing machine. After trying to tackle something so large on her home machine, she called me to ask if I could finish it for her. Only half of her blocks were cross-hatched, and none of the sashes or cornerstones were stitched. There were lots of basting threads holding everything together, and grey pencil marks in all of the backgrounds on the un-stitched blocks! 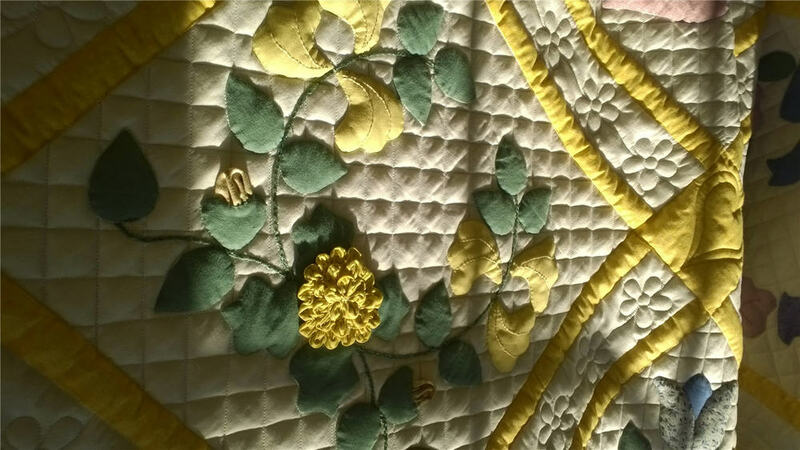 Elaine had drawn a cable pattern around the outer border of the quilt, and managed to complete machine stitching the entire area. The remaining sections to be finished were all of the sashes, the cornerstones, and half of the cross-hatched blocks. The beautiful applique needed to be held in place too. 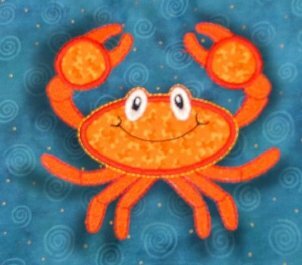 Elaine has been doing hand-applique for a long time, and has really shown that she is ready (willing and able!) to tackle any pattern she wants to try. With numerous projects started, she really wanted to see this one finished. It was going to be a gift for a special family member. 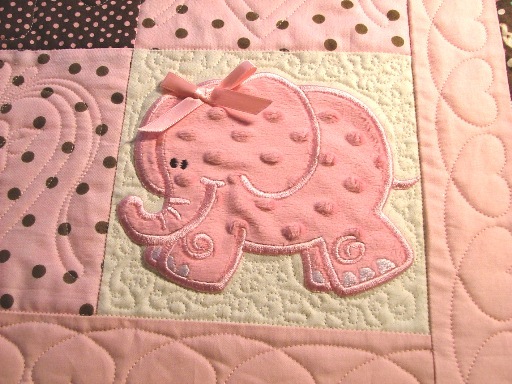 I duplicated her cross-hatching and chose the designs for her sashes and blocks. 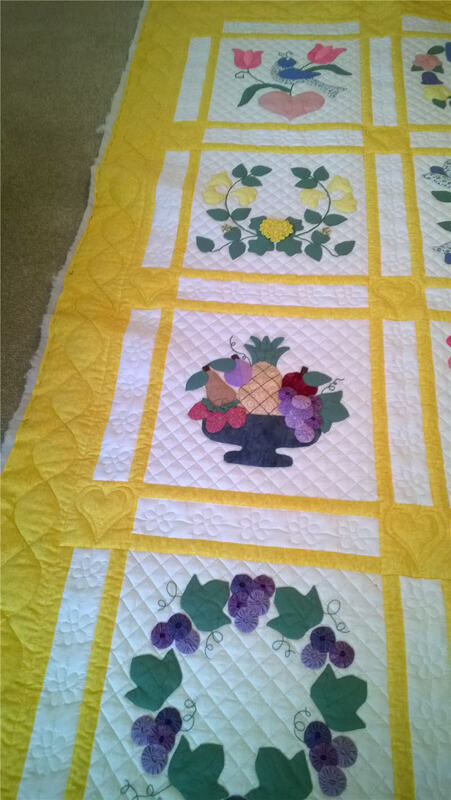 After the quilt was finished, she was thrilled with the results. 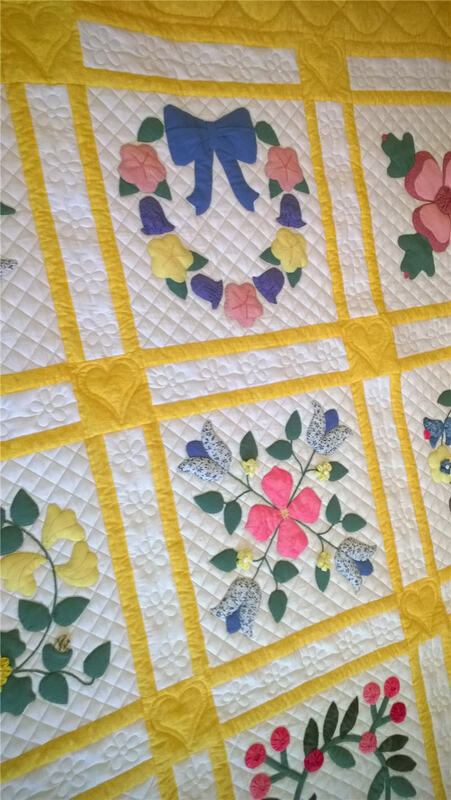 Enjoy the gallery below to see close-ups of the blocks in Elaine’s quilt. 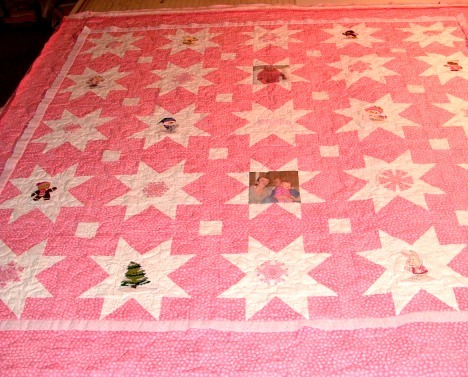 I was thrilled when Barbara brought this quilt in to be finished! I love anything patriotic, and this was a true original! 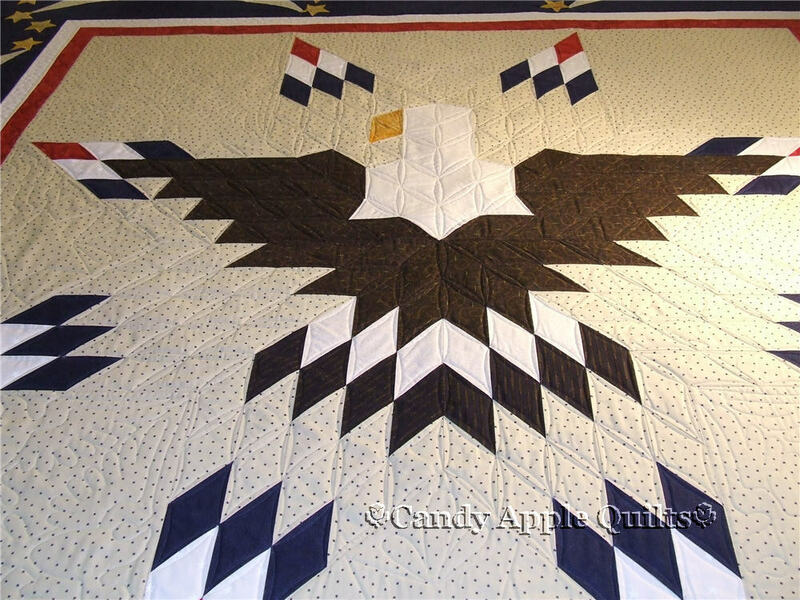 It's based on a Lone Star quilt, with the different areas being changed to suit the design of the eagle in the center section. Barbara took it a step further though, and added her own ideas for the borders. 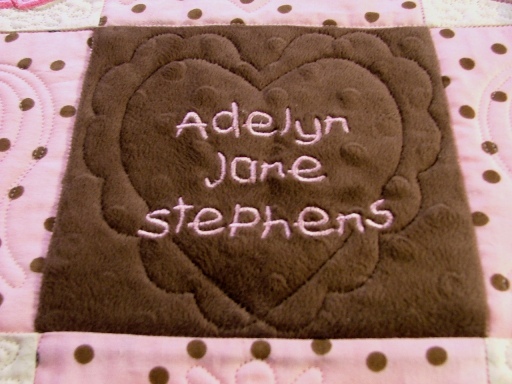 Using her embroidery software, she added lettering in the large outer border, and also appliqued swags. 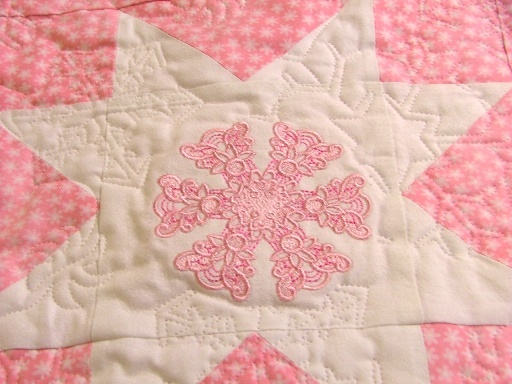 I love the circle of stars that she designed! All of the pictures are below. Make sure to "open" them by clicking on each one, and then clicking again, so that you can make them larger and see all of the detail. What would be more perfect for Valentine's Day (or any day?) with your sweetheart than fluffy towels, a bottle of wine, and a warm candlelight bubble bath? 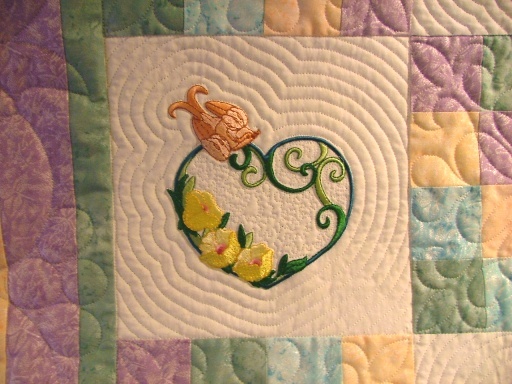 You could even applique this romantic design on to a matching nightie, or cover for your wine bottle. Order this project today and celebrate in style! 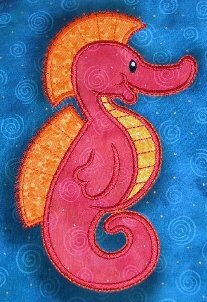 You will receive a zip file with an embroidery file of your chosen machine format, a PDF of instructions for stitching the applique that includes photos to make this romantic project quick and easy -- even for a beginner! Lynne's embroidery is amazing! 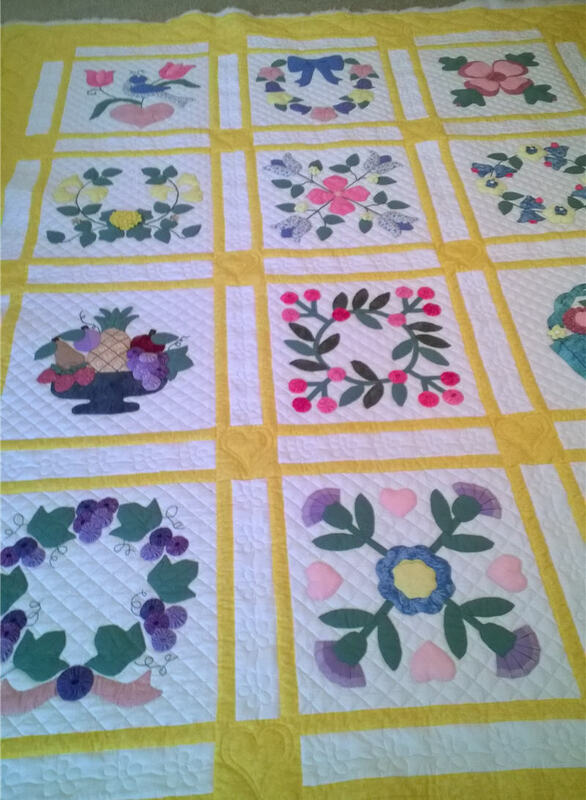 She chose the designs called Marcia's Ornamental Gardens by Pfaff#398, added a gorgeous batik, and completed a wonderful family heirloom which she has named "Ornamental Beauty"! 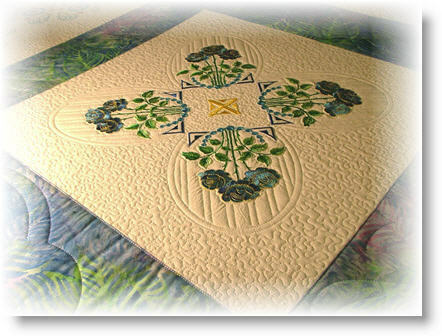 There are 19 designs for the 5x5 hoop, and the way Lynne combined all of them to create this beautiful quilt is simply breathtaking! Click on any picture to be able to see all of the beautiful designs. Imagine my surprise when I received these beautiful pictures in the mail! 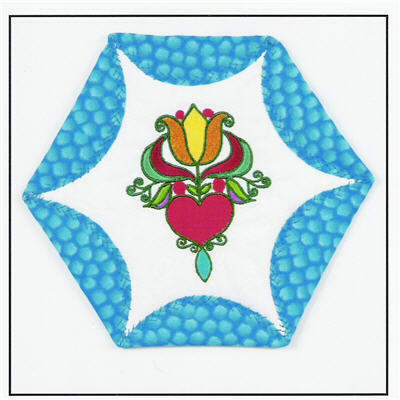 Carol used the Pennsylvania Dutch embroidery collection to make beautiful coasters for her friends. I really like the way these turned out, and I just love the hexagon shape that she used for them. Fantastic! 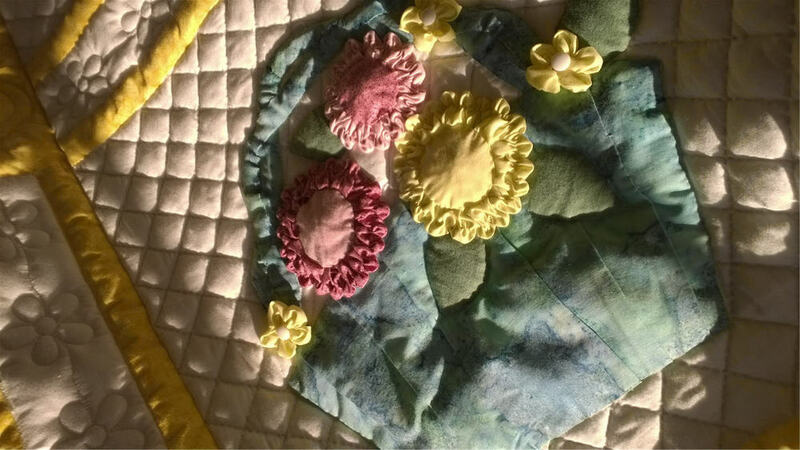 There are many patterns to choose from these days that are geared toward busy schedules, and this cute quilt from Connecting Threads is one of the best. 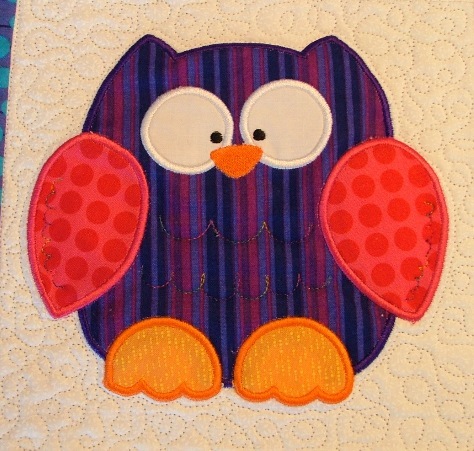 It features owls that are bright and happy, and the Hooterville kit has all the fabric you need to hand-applique each owl and tree. 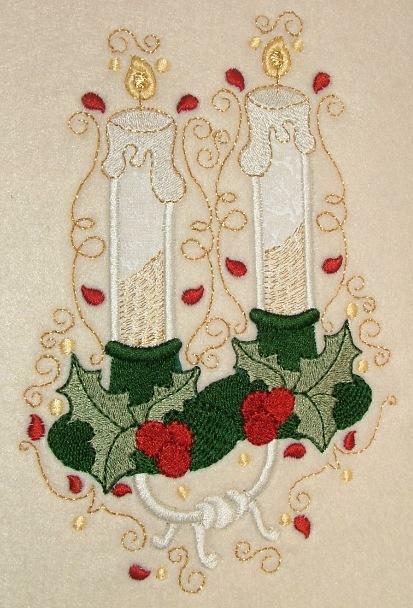 It's designed by Linda Hohag of Brandywine Designs. 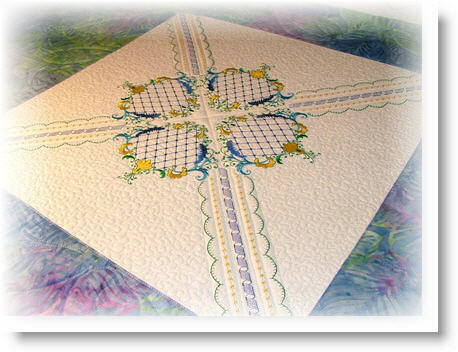 Needing a gift quickly, my friend Linda decided to make the center border from the same fabric as the outer border. 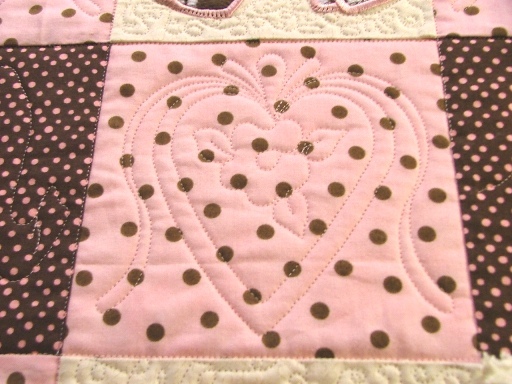 Hearts are quilted in the center border, and stars are quilted around the outer edge of the quilt. To take it one step further, the owls and trees were digitized so each block could be machine embroidered. This gift was finished in a flash! 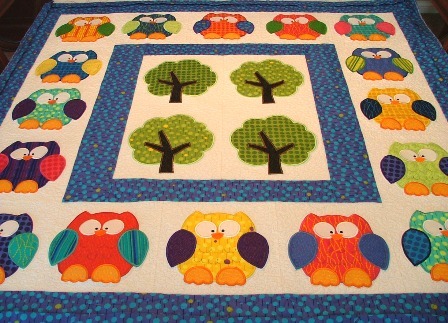 Details were quilted on the owls and trees, and stippling fills all of the white areas. 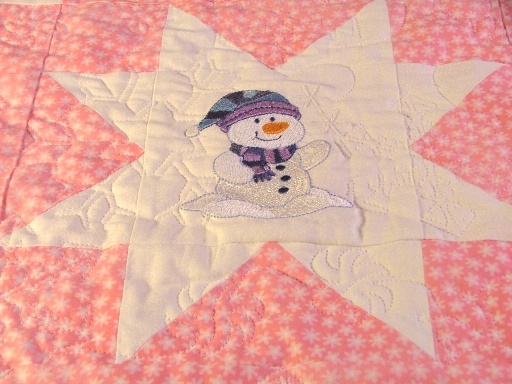 This quilt was fast and fun! Make sure to click each image twice, so you can see the largest version. We will never forget. Please remember to fly your flags today, and pray for our soldiers and their families. 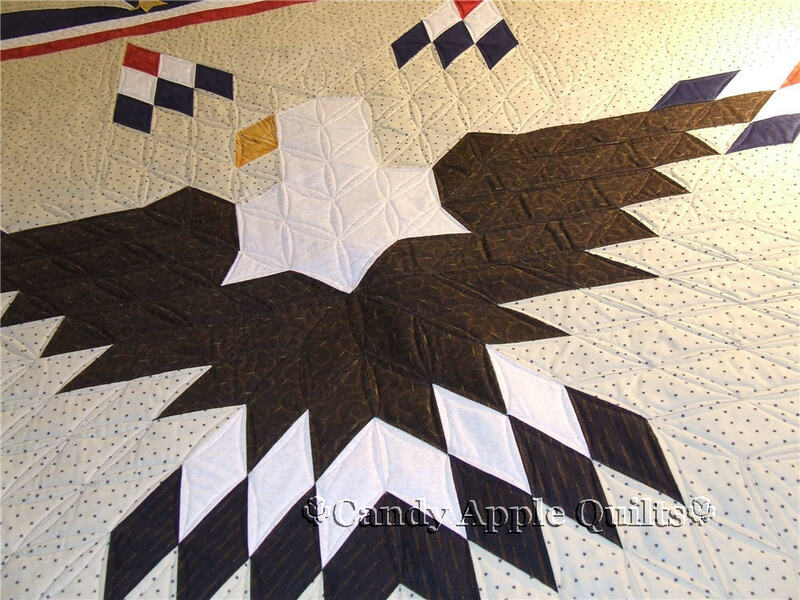 Show your patriotic pride with our embroidered eagles! The "Song of the Heart" collection of designs from Madsen Originals really captured my imagination! 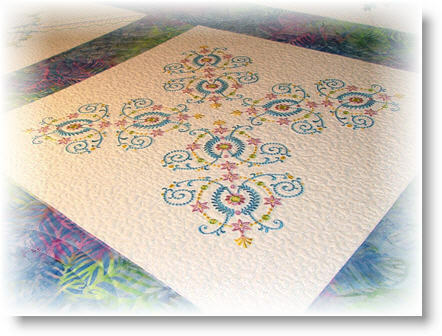 These designs are exquisite, and I would never think of quilting over top of them! I wanted to have the white background area stay nice and flat, so I couldn't just leave it empty. 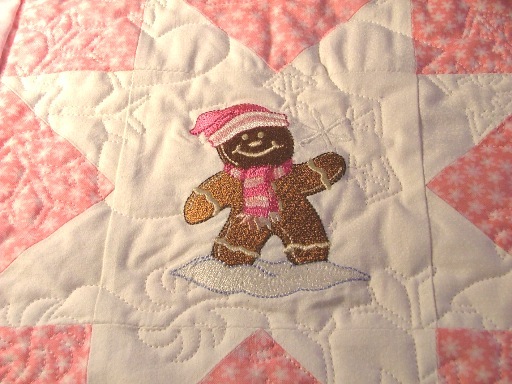 I decided to record my stitches as I quilted right next to each design. Then, I echoed my stitches 13 times for each block, at one third of an inch apart. This filled the entire background of the block. I used the Trim function to remove the excess stitches that I didn't want, which left me with just enough stitches to have everything lay nice and flat. I added a little bit of stippling freehand inside of the hearts. 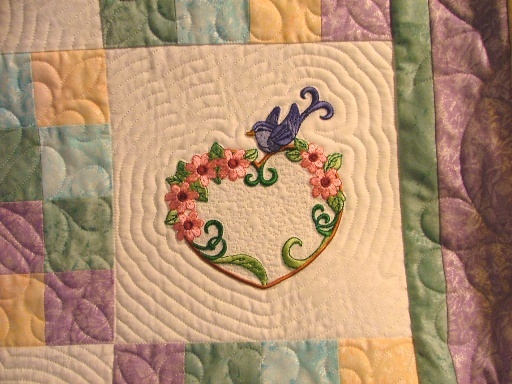 Priscilla wanted all four borders around the outside to appear as if it were one border, and to be lightly quilted so it would not detarct from the embroidery designs -- good choice! I have a love/hate relationship with Minkee — but mostly love! Leslie brought two quilts recently that both have Minkee involved. 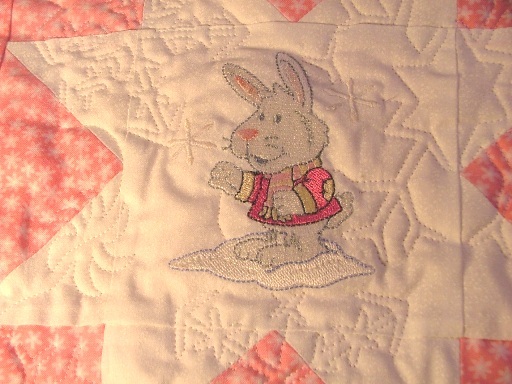 One of the quilts had a Minkee backing, and the other quilt featured Minkee on the front for applique fabrics. Minkee can be tricky to work with on a longarm machine. 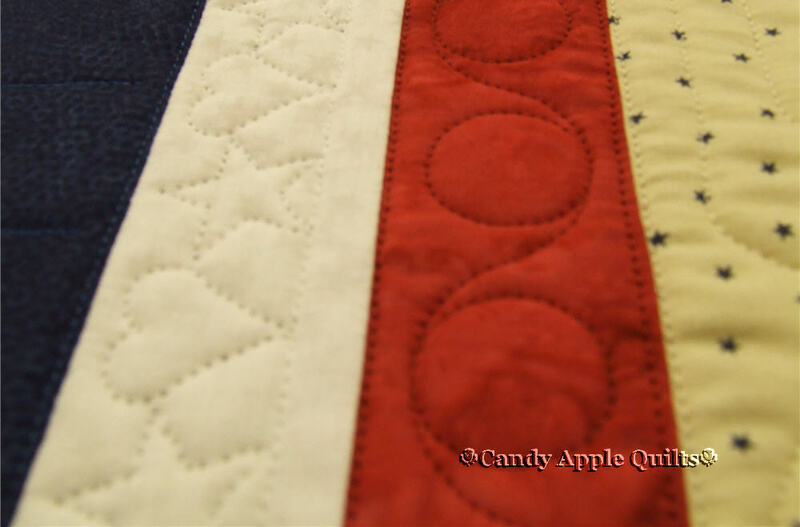 Keeping the stretch parallel to the rollers will help to keep the stretchiness of a wild Minkee backing tamed. 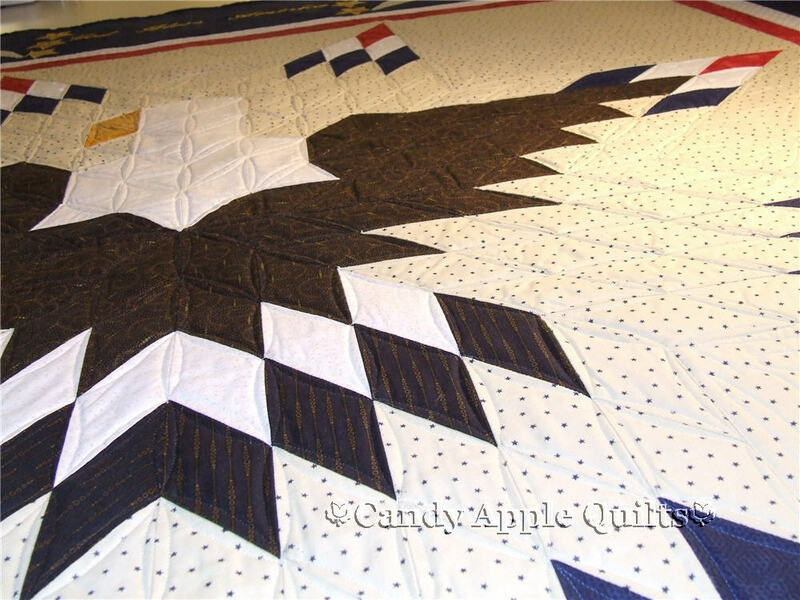 Also, keeping the side clamps very loose —- so loose that you will think that the quilt top looks rather baggy —- will also help you to avoid having the backing shrink up when you remove the quilt from the machine. 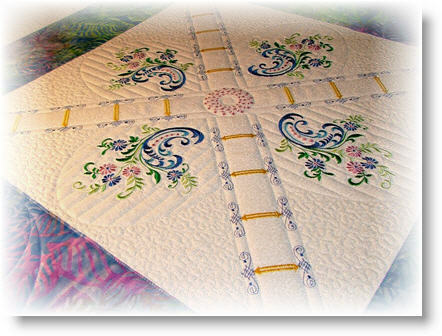 The most important tip I like to pass along is: REMEMBER NOT TO ROLL THE QUILT TOO TIGHTLY. If that’s the only tip you remember, you will avoid a lot of headaches. 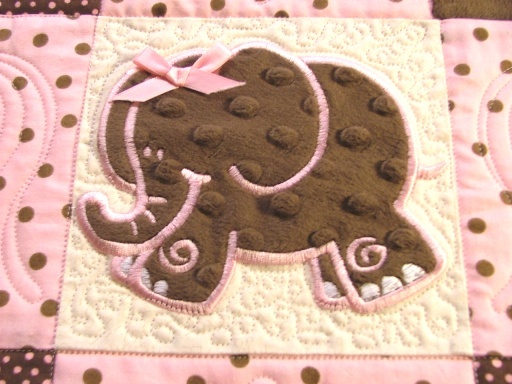 If this backing had been pieced out of any other fabric but Minkee, I would have removed it from the machine and done the piecing over. 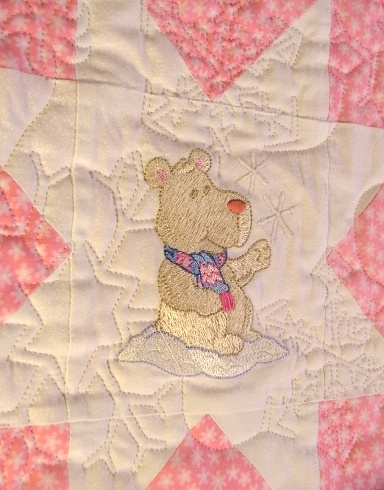 As it was, I held my breath and let the extra fabric be absorbed by the dense snowflakes that would be quilted on it. If you have any frustrations during the process of working with Minkee, just slide your hand across the wonderful fabric and you will be guaranteed to smile! 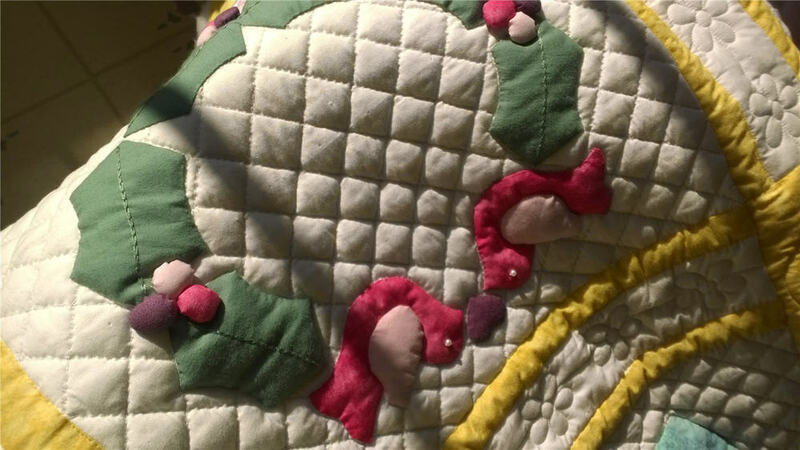 If you would like to experiment with a little touch of Minkee, but don’t want to use it for the entire quilt, consider using it for your appliqué fabric. 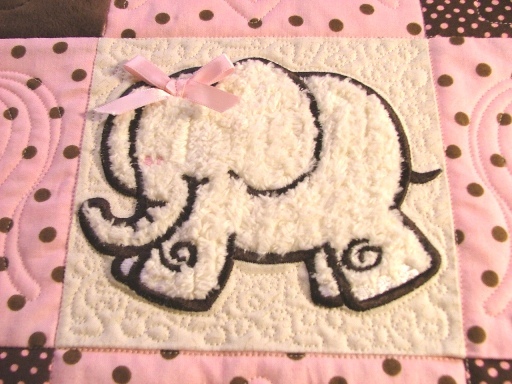 Leslie brought over a quilt that had adorable elephants appliquéd on it, and she used various pieces of Minkee as the appliqué fabric. 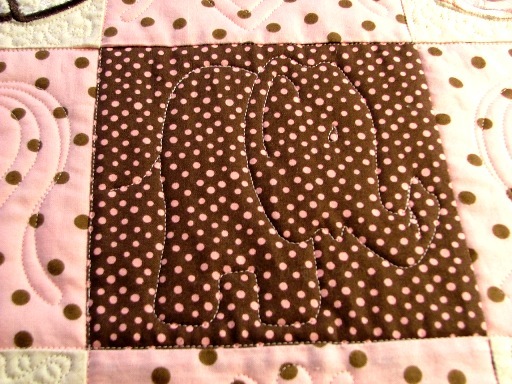 She used flat Minkee, striped, nubby… a little bit over everything. The elephants look so cute with the little bows on their heads! Nine elegant designs, combining the best of applique and embroidery. There are so many possibilities with these designs! 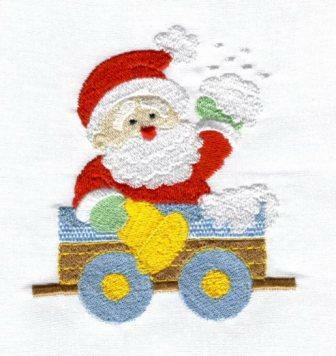 Table cloths, napkins, placemats, sweatshirts, quilts, sweaters, cookie tins, gift boxes and tags, pillows........ 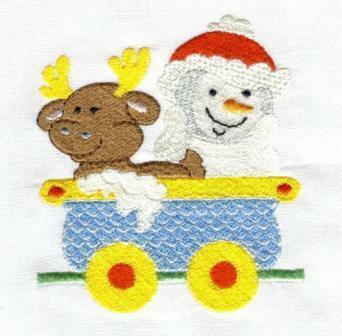 These designs were featured in the November/December 2006 issue of Designs in Machine Embroidery Magazine. To order these designs as a collection, please visit our store. These are actual stitch-outs of the designs -- you click click on each image to see a larger picture. Have your own little piece of the heartland! This collection of six Pennsylvania Dutch motifs looks wonderful on table linens, pillows, curtains, and many other places! Each design fits in a four by four hoop. Click on the pictures for close-up detail of the actual stitch-outs. Welcome to our own little island get-away‚ Under the Sea! This collection of eight wonderful sea creatures would love to swim into your life. 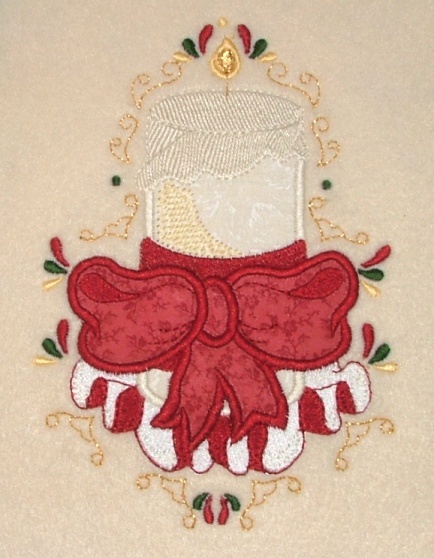 Each applique fits in a five by seven hoop. To purchase this collection, click here. The Snowybears are ready to play! 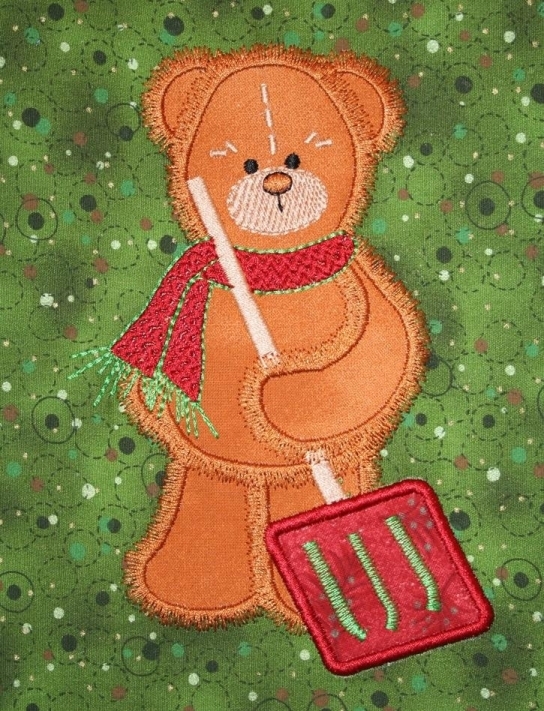 The Snowybears are here to have some winter fun with you! 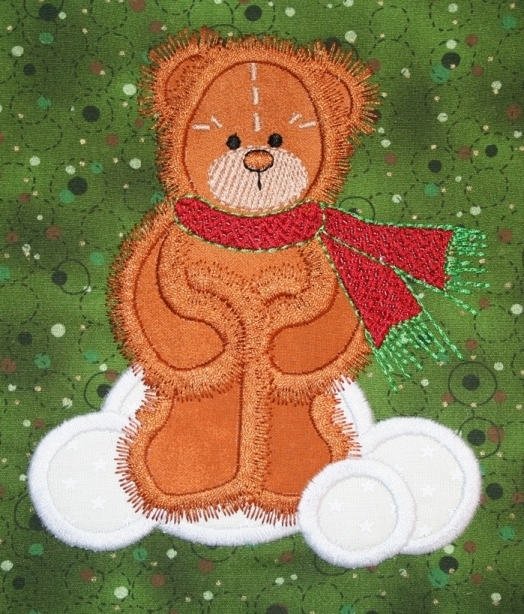 Machine embroidery, applique, and a gentle fur texture to their coats! Easy enough for a beginner, and fun for the entire winter! To order these designs, click here. 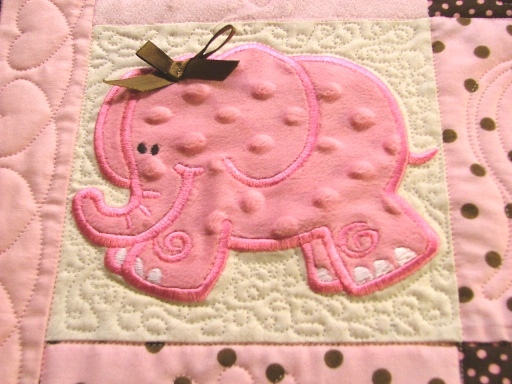 These designs combine the best of applique and embroidery! 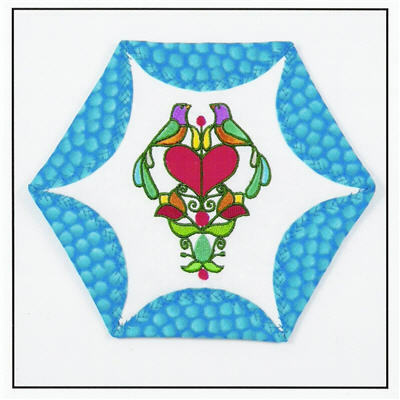 Fast and fun, these are sized for the 5x7 hoop. You can use them on blue jeans and jackets, curtains, towels, etc. 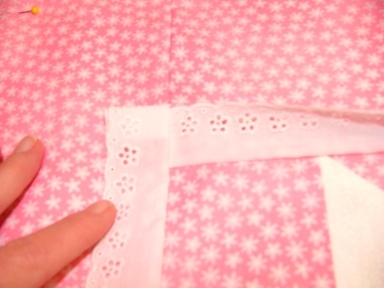 Click on each picture below to see the details of the actual stitch-outs. To purchase these designs as a collection of six designs, click here. To purchase any of these designs individually, click here. There have been lots of requests for these placemats, and we have various colors to choose from! Just think of what you can do with these! 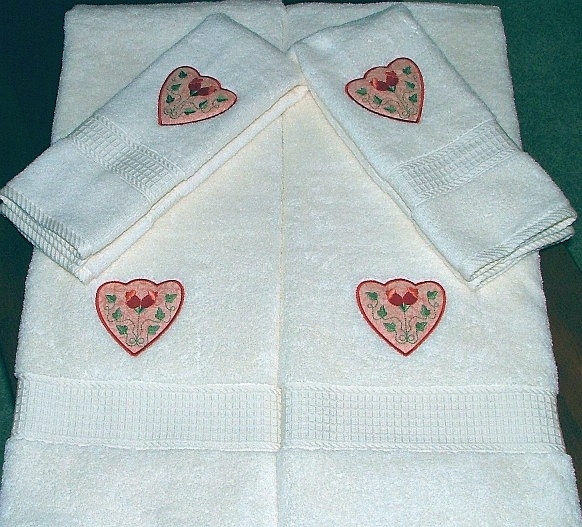 You can use them unadorned, and embroider them when you have some free time. You can make a set for yourself, and your best friend at the same time. You can turn them into book covers, cake or bread baskets, tote bags or make-up bags --- the possibilities are endless! 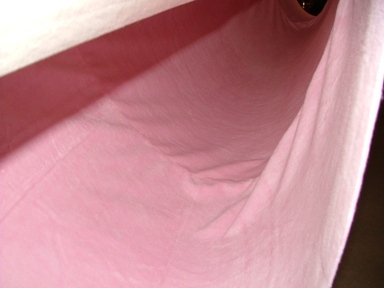 This has been one of our top sellers in embroidery blanks! Check back often for new colors, or feel free to contact us with a specific request. You can also send in your own fabric --- this makes it easy for you to coordinate with your existing items! With custom orders, we will need a 2-3 week lead time to create your special items. 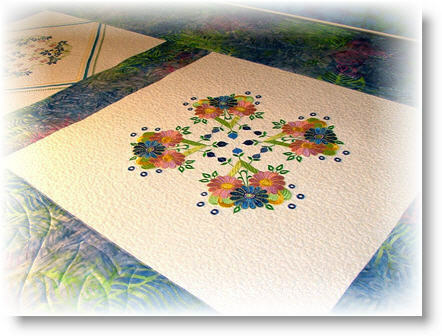 What you will receive with your order: Four placemats measuring 18 x 13 inches that are all in one large panel. 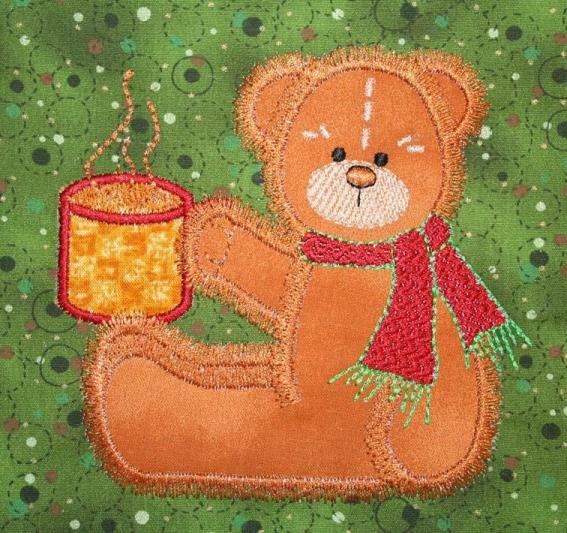 You will have extra fabric surrounding the placemats that you can use to test your embroidery stitches, or painting techniques, or coloring ideas. 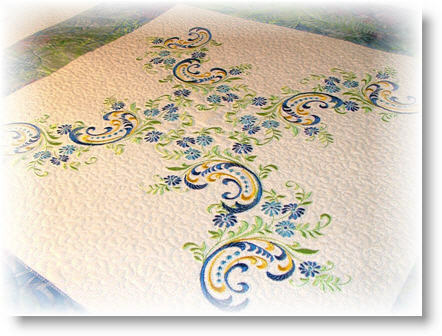 You will be supplying your own binding fabric so that you can coordinate colors with your embroidery stitches or make a set of matching napkins. 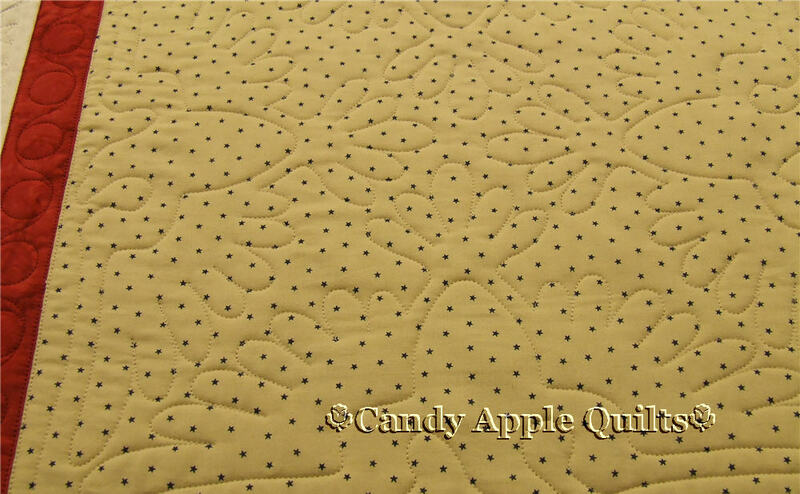 If you want the exact matching fabric for the placemats, please make sure to order it as a separate item. Due to high demand, placemats are temporarily out of stock --- please check back soon. 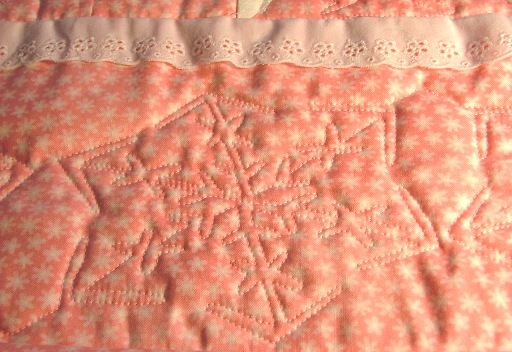 The design that is embroidered on the peach placemat above is from A Design by Lyn and is called One by One. Thank you, Lyn! This placemat features an adorable butterfly from Designs Sew Fine and is part of the Butterflies II collection. 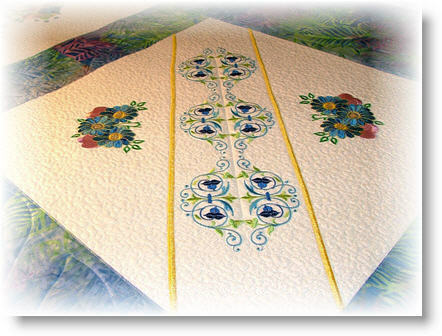 A contrasting fabric was added to the edge of the placemat, and finished just like a small quilt. This is a great idea! You can make napkins to coordinate with your binding! Download a PDF with instructions now, and you can see how easy it is to create your own custom look! 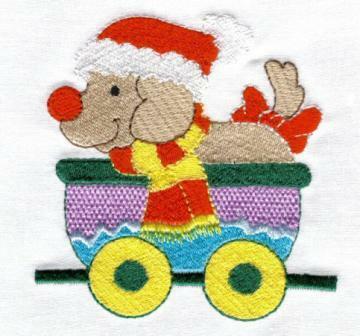 We're currently adding the embroidery designs back to this site, and we are having a few growing pains. You can access the designs by clicking on the left side of the page where it says Embroidery store, or in the yellow box at the top of the page in the link that says The Embroidery Store is now open. When you arrive at the store, some of the individual designs are marked as Out of Stock. This is one of the growing pains that I mentioned, and our web master will be fixing this just as soon as he can. All of the designs are available for your shopping cart. Another growing pain is on the Collections page. You can see the name of the collection, but none of the individual designs that are in the collection. I've decided to feature two of the collections here, because they have a Christmas theme, and they are on sale right now! I just received the cutest picture from Linda! 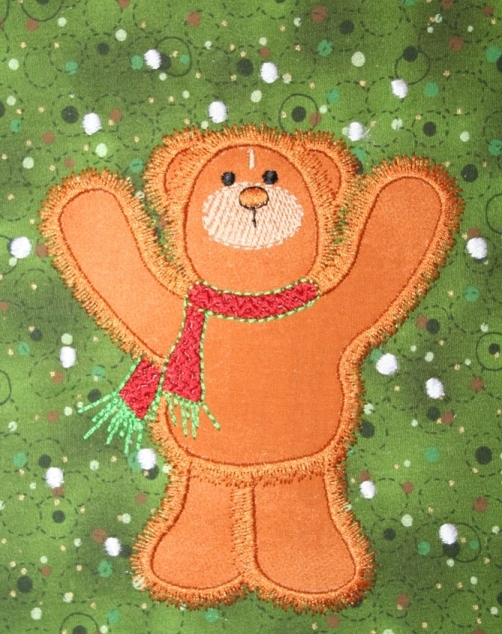 She used the Boo Sign Applique and created an adorable wall-hanging! What a creative idea, Linda! Thanks so much for sending along the picture! Amy sent along a picture of how she used the same design on treat bags. I just love this! Thanks, Amy! 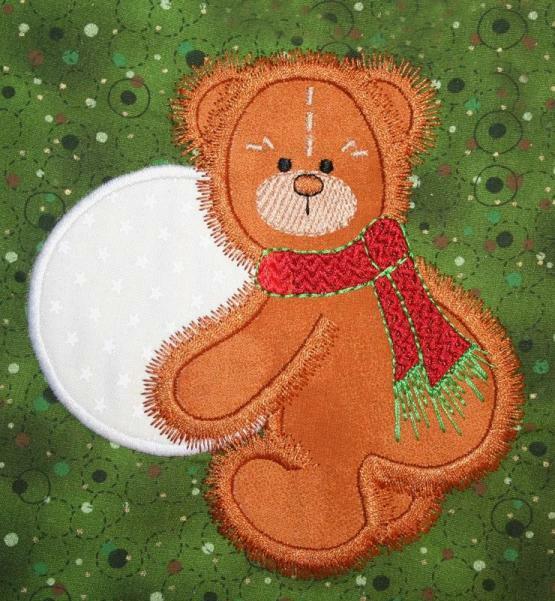 The Boo Sign Applique is available as a single design, or as part of the Autumn Collection that is on sale right now. You will receive 18 designs for one low price! 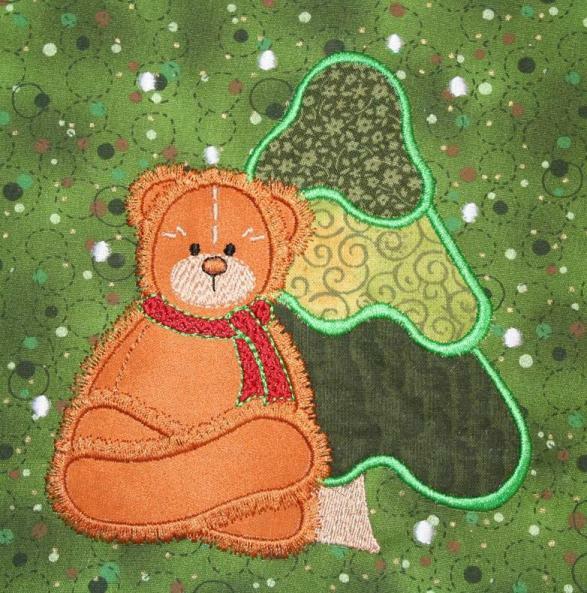 This pattern goes together very quickly, and gives you lots of open space in the center for adding embroidery and appliqué! 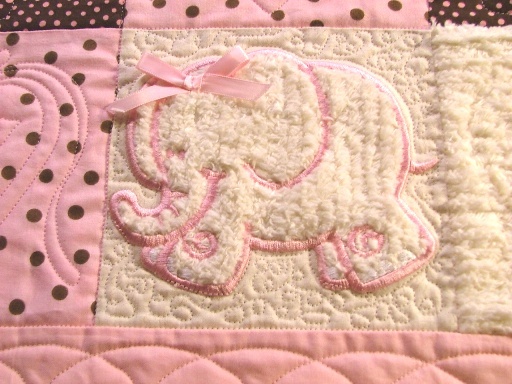 There are only 14 blocks to piece, and two outer borders, so it will be on your table quickly. For free directions to make this tablecloth project, write to us and you will receive a PDF file right away. 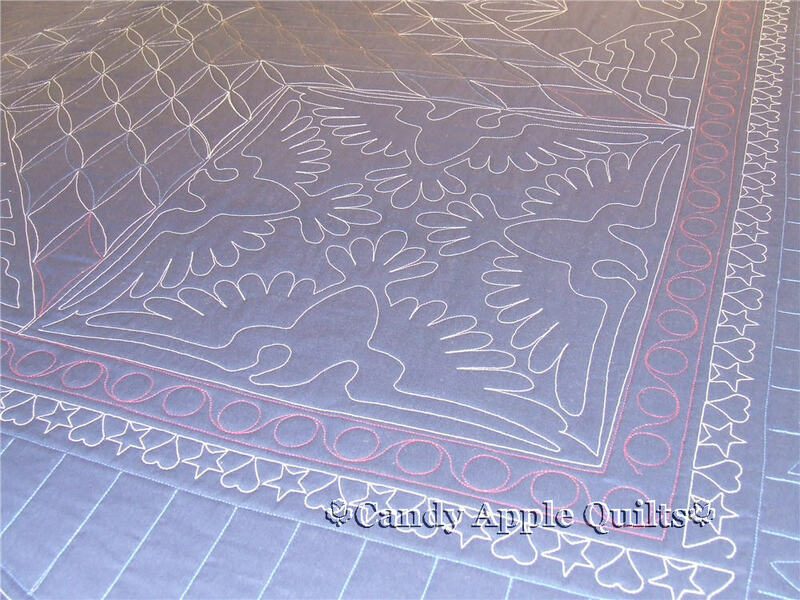 Simply send an email to Robin@CandyAppleQuilts.com with "Free Tablecloth" in the subject line. 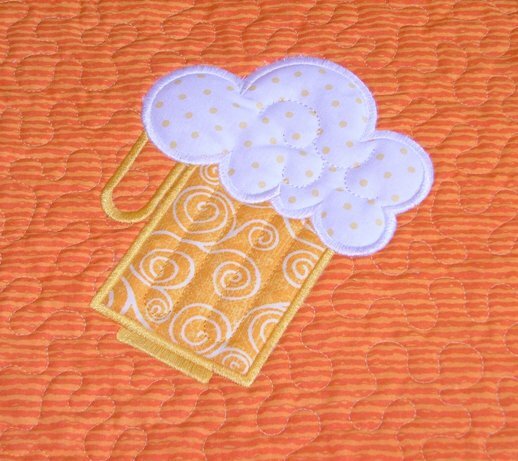 Click here to purchase the embroidery machine files for the beer mug applique pattern that I used in this project, it's available for instant download in DST, HUS, JEF, PES and SHV formats.